Oh what a weekend! As a stay at home mom, I say TGIM! This weekend I started a new project. It’s probably not going to be something I put on ETSY and it will take weeks to finish. What I will gain from it is patients. I started a cross stitch lap quilt. I have done one of these before, when I was pregnant with my first son and I spent weeks cross stitching it, only to never finish it, I never did the quilting part of it and so all I had was a quilt top. The other day while thinking of what to do next, I came across this pattern and knowing with my mother’s cross stitch threads so neatly organized I would have all the needed colors. My mother was a fantastic cross . 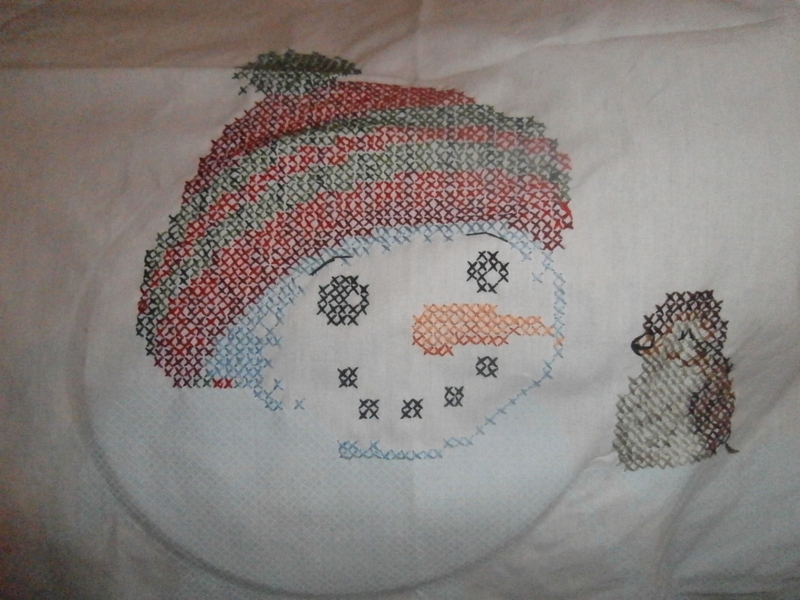 What I am working on, I am sure she would consider it a “cheating cross stitch” meaning that on the fabric is the little X’s needed for the pattern. I have tried cross stitching the “good way” many times, but it is incredibly difficult, all the counting and tiny little holes and all of the shades! Ugh! I always loose my place and make many mistakes, get frustrated and quit the project in frustration. However these “pre-printed” projects, I enjoy. I named my ETSY shop BadStitches, cause I am bad at hand stitches, but really, it’s only because I haven’t really tried. Well, that’s not true, I do try, I just need practice. I figured when I saw this old and forgotten project in the trunk, I knew this is what I need to be patient and to follow a pattern. It’s more of a training myself to be more observant of the importance of keeping the stitches neat and tidy and remember than following a pattern is a good thing!